Yang Xia, Associate Editor at Nature Communications, shares her notes from attending the World Cities Summit 2018 in Singapore. The three parallel events this year emphasize technology, inclusion and solutions, moving towards small-scale, human-centric and decision-supportive research. It's a great pleasure and wonderful experience to attend my first conference as editor this July. It is the World Cities Summit 2018 held in beautiful Singapore from 8-12 July. The event brings thousands of attendees from government authorities, NGOs, business and research communities. The summit has another two parallel events: the Singapore International Water Week and the Clean & Environment Summit. There is too much takeaway information to share but here, I share the most exciting and interesting parts. In the session “Healthy Cities – Practical Advice on Inclusion and Health and Space” I had a nice conversation with people from Gehl Institute (Helle Soholt), Novo Nordisk (Bo Wesley) and Robert Wood Johnson Foundation (Sharon Roerty). Their common theme is to help cities develop public open spaces that incorporating human health consideration. In other words, it aims to build open space to be more inviting and accessible through design that also support health and contribute to health equity. Given the role of city space in shaping human health, Helle took Copenhagen as an example to demonstrate its strategy to integrate health in public space. It’s interesting to see that Copenhagen adopts an open space municipal strategy to incrementally connect separate open spaces. Citizens are provided with bicycle account, ‘green wave’ road, kids cycling way and harbour bath that help shape a healthy lifestyle in a way that also improves city capacity and liveability. 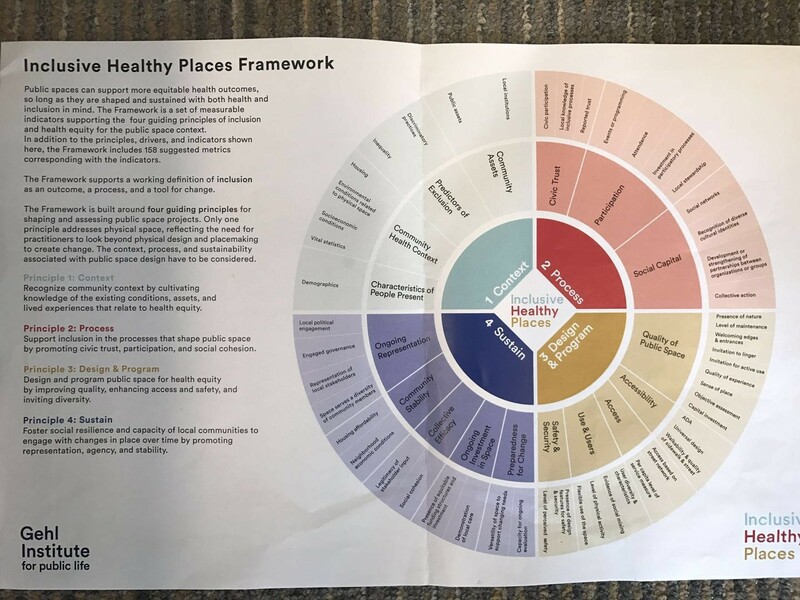 Jennifer (also from Gehl) introduced their developed framework, called ‘Inclusive Healthy Places Framework’ (see from the photo below). The framework covers community context recognition, public space shape process that supports inclusion, public space design and program, as well as social community capacity development. I quite like the concept of ‘inclusion’ that can be defined as an outcome, a process and a tool. They suggested that scientific communities should be the back-up for their projects. Specifically, Jennifer highlighted a lack of quantitative and quality tool to quantify the benefits of public open space on both physical and mental health. The parallel thematic tracks are also insightful. I attended two of them, one is on Environmental & Economic Resilience and the other is City Finance in the Future. It was interesting to hear people from different sectors to express their views on the same urban issue. Ahmed Aboutaleb, the Mayor of Rotterdam commented on the urban resilience by emphasizing the collaboration between industries, leadership, regulation, science and international agenda and more importantly, he underlined the challenges in developing social resilience as its outcomes would take longer to be realized and mostly are less visible compared to environmental or economic resilience. In contrast, Jenny Bofinger-Schuster, Vice President of Siemens, from a business perspective, defined resilience as innovation and technology, intelligence, health and responsibility that all require smart solution and stable infrastructure. Another businessman, Jeremy Bentham from Shell compared different economic and social frameworks under a thriving city and a sustainable city. While the former relies on reinforcing circle through strengthening competitive advantages, public and private sector investment and talent pool, the latter emphasizes an integrated, compact, collaborative circle. The track on City Finance emphasized the importance of government-business-private sector collaboration. An impressive view came from Michael P.M. Spies, the Chair of Investment Committee, Tishman Speyer. He argues instead of relying on external financial sources to endlessly develop infrastructure, a city can strengthen capacity and save themselves money in alternative ways. This can be done by exploring underground capacity, connecting separate buildings, providing mobile services and developing outdoor workspaces. More efforts should be devoted to improving urban efficiency that can also foster new sources of business profits, tax revenue and public benefits. 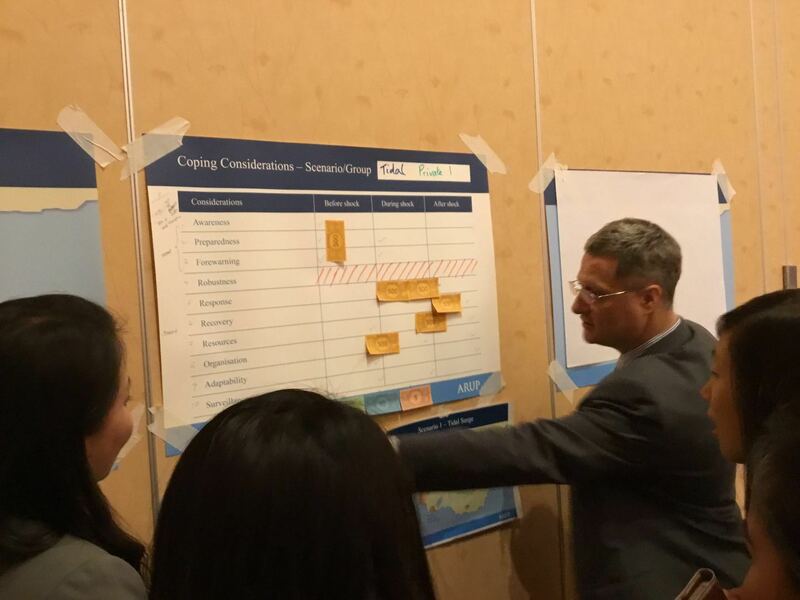 The International Water Week has parallel workshops covering four broad themes: wastewater treatment, water network, water quality and health, and water for liveability and resilience, each with a corresponding poster section. Technological innovation appears to be a highlight for both waste water treatment and water network management. Businesses play a key role in providing digital intelligence and technological services to enable more flexible, integrated, solution-oriented, and consumer-centric water treatment and network management solutions. Albert Cho, the Vice President and General Manager from Xylem has shown us the impressive digital development in water network management by detecting real-time disruptions and root of the causes by using greater temporal, spatial and parametric data density and sensor density. He suggested future water management systems should be more decision-supportive while targeting human health and environment. Roch Cheraux, CEO at SA water, Australia brought in an interesting view on water network digitalization. He suggested apart from improving efficiency and service quality without raising costs, the more important task is to take customers on the journey, indicating a human-centric trend in a digitalized world. The focus was on emerging contaminants. John Fawell from Cranfield University raised an interesting point regarding risk assessment studies for water contaminants. He suggested risk assessor should specify extent of precaution that should be made for various contaminants and how they can be used in decision-making. An interesting poster piece can be seen from 'Child stunting and cognitive impacts of water and sanitation in Indonesia' (Lisa Cameran, University of Melbourne), which shows that owning a toilet and living in a community where most of neighbours own a toilet are important drivers of a child's cognitive development. It's exciting to see that there is a growing emphasis on climatic extremes adaptation. Mike Dobson from ARUP, a world leading environment consultant company, has shown us their proposed disaster planning matrix to guide government better cope with any climatic extreme. The matrix encompasses awareness, preparedness, forewarning, robustness, response, recovery, resources, organizations, adaptability and surveillance, where government should devote different amounts of money before, during and after extremes according the distinctive local contextual factors. As you can see from the photo, we were pretending a national leader to allocate financial resources in each category for our little island! Overall from the international water week, I can see a trend towards smaller scale studies with tech-based, consumer-oriented and decision-supportive solutions. They focus more on specific locations, specific groups of people, a specific issue and specific industries rather than a global scale study that tends to cover everything. I was quite impressed by novel and new angles from industrial and business persons and that they do care about the social science aspect of water related problems. To effectively convey and explain what a research journal, like us, expects from publications is crucial. I had a great chance to have a conversation with Esther An, Chief Sustainability Officer from City Developments Limited, a leading company in strategic sustainability integration, reporting and green financing in Singapore. When asking her view regarding achieving environmental sustainability in a pace of urbanization, she emphasized the role of stakeholder engagement. She further provided insights in engaging stakeholders from a business perspective. They developed green lease partnerships by installing cdl-tuas power automated meter reading portal to allow tenants to track their energy consumption. They’ve also built sustainable cities and communities through collaboration and partnership, as well as invested in national platforms such as Green Library and Botanic garden. She also shared some local-scale research that I found quite fascinating. They conducted a survey among homeowners regarding their willingness to install loft insulation and found that financial incentives, such as group discount, are not effective in raising the uptake but provision of loft clearance services can raise the installation by 2.8%. There is too much to share with you from the World Cities Summit. It is a great experience to meet people from industries and government, who we are not as familiar as researchers. The most impressive thing is how novel and interesting their views regarding the environmental, economic and societal issues are. They have the same desire to develop tech-based, solution-oriented and human-centric solutions for a better world and a better future. Isn’t this also exactly what we are aiming for? I had my BS in economics, MS in sustainability, both from the University of Leeds, and a doctorate in ecological economics from the University of East Anglia, where my research interest lies in assessment of the socioeconomic impacts of health outcomes resulting from disasters such as heat-waves and air pollution. I'm now handling manuscripts on socio-economics, climate-related health risks, climate policy and sustainability.